Teresa Stokes is an internationally acclaimed aviation and space artist as well as the top stuntwoman-wingwalker in the World. She lives at her houseboat-studio near the Johnson Space Center in Houston. Award winning Teresa Stokes Aviation Art specializes in custom commissioned fine art paintings of aircraft, skyscapes, and space flight. Limited Edition prints of her work are marketed in galleries through out the country, and displayed in museums worldwide. She is also a pilot with multiengine, instrument, and commercial ratings, and enjoys flying aerobatics herself. She sometimes flies the Showcat to some of their shows, but usually flies the teams’ twin-engine plane to and from. In addition to her flying and boating, Teresa owns four classic cars of 1940’s, 50’s, & 60’s vintage, which she enjoys restoring, maintaining, and driving. Teresa was voted most talented senior girl of her very large class and went on to study art at the Maryland Institute, College of Art and the Atlanta College of Art. She researched World War II aircraft when she lived in London where she was elected Associate Member of the Guild of Aviation Artists. Her expanding series of limited edition collectors' prints are distributed internationally through galleries and museum shops, and she serves a steadily growing demand for commissioned paintings. Her conceptual aircraft renditions and illustrations are also extremely popular, including the comical customized "Plane 'n Pilot" caricatures, one of which was flown aboard the Space Shuttle Atlantis on STS 27. Another was flown also on the Atlantis aboard the STS-106 mission. Teresa designed the paint scheme and artwork on Gene Soucy's Showcat and his striking Extra 300S and Extra 330XS monoplanes. In the past she has done works of art for several major rock bands such as the band caricature artwork on the inside of the Aerosmith’s “Rocks” album and CD. 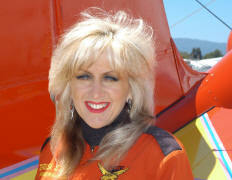 She has been the official artist for the airshow industry’s “ICAS Hall of Fame” portraits since 1995. 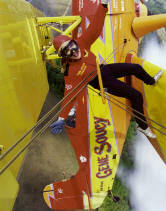 Teresa has been wingwalking on Gene Soucy’s Showcat since 1988. She says it is an inspirational way of experiencing her artistic subject matter, and loves the thrill of every flight. It affords great opportunity for meeting new people, exciting travel to new places in the barnstormer mode of yesteryear, and to work at the most fun job in the world! Won her first art contest at age 4. Elected Associate Member of Great Britain’s Guild of Aviation Artists. Another of her original paintings was also flown in space aboard Atlantis on mission STS 106. Pilot with over 1500 hours of flight time. Pilot Ratings – Commercial, Instrument, Multi-engine, and Aerobatic pilot. Official Artist for the International Council of Airshows annual “Hall of Fame” portrait plaques. Created and painted artwork used on album cover for rock group Aerosmith on their “Rocks” album and CD. Established Teresa Stokes Aviation Art in 1977. 1980 – Began publishing her work into a growing series of Limited Edition Aviation Art Prints. 1988 – Began wingwalking with Gene Soucy on his Showcat. Now the most experienced and recognized wingwalker in the airshow industry. Has artwork in museums and galleries all over the world including two Royal Palaces, and the Johnson Space Center.